Three army jawans lost their lives and at least four others were injured on Saturday in an ambush by suspected activists of banned ULFA (I) faction in Tinsukia district of Assam. The jawans were reportedly killed in an IED blast. The three slain jawans – identified as havildars Multan Singh and Rishi Pal and naik Narpat Singh – were from the 15 Kumaon Regiment. This is the first major attack on security forces by the banned United Liberation Front of Asom (Independence) in the state since the BJP-led government of Sarbananda Sonowal came to power in May this year. According to the Police the heavily armed militants ambushed two vehicles of a army convoy in a forest area, near Pengeri at around 5.30 am. The vehicles with army personnel were on their way to the oil town of Digboi. A army vehicles—a truck and a Maruti Gypsy— were targeted with bullets and rocket-propelled grenades by militants hiding behind roadside trees and bushes. “They also detonated an improvised explosive device (IED). When the jawans got down from their vehicles after the blast, they were attacked. 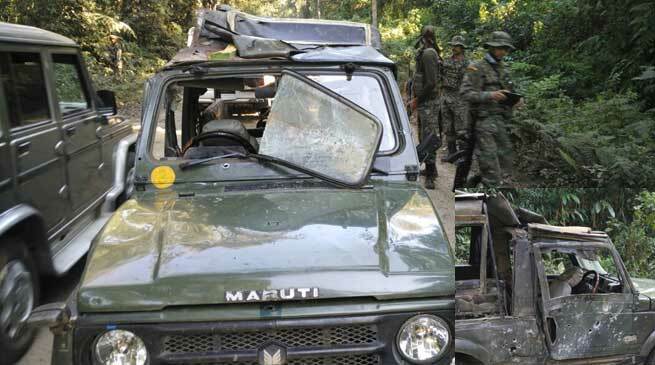 Saturday’s incident took place near the area where one person was killed and two others injured in an earlier attack on Wednesday, also by suspected ULFA (I) when ULFA (I) open fire on a Cash Van carrying salary of tea labours.